DailyHoroscope.com Master Astrologer Rick Levine and fellow astrologer Jeff Jawer appear together in the series of daily Planet Pulse Video Horoscopes, and they co-write Your Astrology Guide, Barnes and Noble's exclusive annual Astrology guidebook, which is now in its seventh year of production. The current Your Astrology Guide -- an unsurpassed 12-month planner for every zodiac sign -- is now available on BN.com, Amazon.com and bookstores everywhere. Rick has written several books and many magazine articles for such publications as Fate magazine, The Mountain Astrologer and Aspect Journal. Rick also has made many media appearances over the years on radio and television, and he is available for interviews. 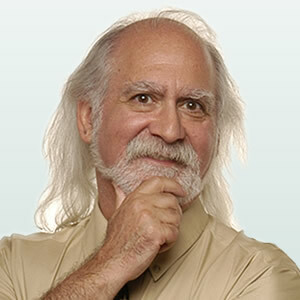 Rick has maintained a high profile of service within the Astrology community. He founded The Center for Astrological Research and Education, and he was a founding trustee of the Kepler College for Astrological Arts and Sciences near Seattle, Wash. Rick was also President of the Washington State Astrology Association for two terms. He is still an active member of the Organization for Professional Astrologers, the Association for Astrological Networking (AFAN), the National Council for Geocosmic Research (NCGR) and the International Society for Astrological Research (ISAR). Rick continues his Astrology consulting practice from his home near Seattle, where he has lived for more than 15 years. Institutional clients have included the Natural Products Quality Assurance Alliance (where he served as Executive Director from 1992-96) and Bastyr University, a preeminent school of natural medicine. Rick also provides one-on-one personal consultations by phone, which he will schedule in advance via e-mail. 116 Comments to "Rick Levine"
why is it so, none of the predictions you honorable made have any relevances on libra. the predictions are derived based on the activities this libra does or makes on the internet. please eat something bitter first so that you will be fresh and can give true things that are on the astrology of libra. Rick Tarot.com is broadcasting Valentines Day TODAY March 11 2015...? When I try to email Rick, an ad for Dell pops up. I am a former client, seeking a reading. How do I contact Rick to schedule? Hi Rick ! I have come accros this free horoscopes about travelling on astrodienst. Its called Astroclick Travel. What do you think? Is it really useful? Have you got any experiences with such a thing? Also, Have you heard of the human design system? Its a system that gives a different reading on peopl'es life charts. Its intereseting waht i discovrede about the prediction for Ra Uru Hu , its creator. It really kind of strikes me to find about some interesting congruence with waht astro click travel predicts. So, maybe its to take seriously. The same could be undertaken to see if someone else , like famous people have got any real life stories related to what the astroclick travel predicts. Let me know if you're curious about such type of predictions and on your experiences with astrodienst in general. I am not a member or colaborator of the site but i do think is good, and of course i love your readings, very accurate and entertaining.! I would be delighted by any answer from you. what part do I deana Thompson a Gemini play in 2015 with love, career, money, educaton, writing a book, past karma. Who is my soul mate is it Taurus my friend and ex I need answer,what should I be investing in to find out clear answers now? Im not ready or equip for the knowledge I ned for everyday events that will come my way to grab the oportines im afraid im fearful should I be? Am I wasting time I haven't started yet? Bonnie, I agree about the repetitive videos. I sent feedback to Tarot.com earlier about it as well. If I couldn't take advantage of the "partially minimize screen" on the computer to block those out, I probably wouldn't watch Rick & Jeff's Daily Pulse or read my Horoscope. I would miss both terribly but the distracting "strobe light" effect is too intense for me. Those repetitive videos, eg. Ellen and Oprah are obnoxious and distracting. what gives? I'm really missing your daily messages. I keep getting ablank page that says Bad Gateway 5.Not good. and financially it has been very tough. Any good news in the future this year? Do you read these? Hi Rick I am born in Switzerland but have been living in Australia for a long time. Are you readings accurate for the US or for Australia, are the houses incorrect?